In my Blue Bunny Personals review, I mentioned Market Basket had a respectable selection of Turkey Hill Ice Cream. At first I picked up an awesome container of TH Box of Chocolates, but then with the blog in mind, I put it back down and decided to go with something that hasn't been on the blog yet. Since I don't really have anything low fat in the freezer, right now, I decided to go with one of their light recipes. 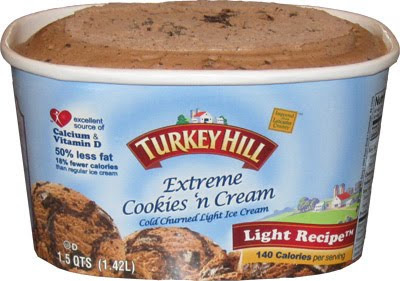 Behold Turkey Hill's Extreme Cookies 'n Cream light recipe ice cream. Why is it extreme? Is this just another marketing ploy? 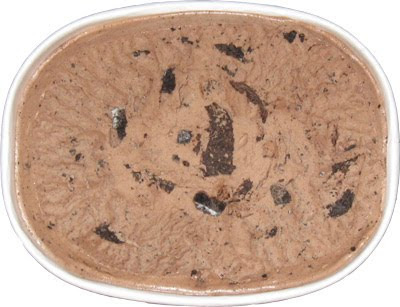 Oh no, Turkey Hill has a secret weapon up it's sleeve: a crunchy chocolate cookie swirl! Ok, those aren't exactly swirls now are they? I'm not complaining (much). I didn't really expect the swirl to hold together as well as it is shown on the label. That huge brown chunk you see in the middle of the image above is a chunk of swirl. It's got a decent thickness to it which means you also get some crunch with it, plus the flavor is pretty good. The dark brownish/blackish chunks are the cookie bits, complete with a bit of cream filling. These also have a nice crunch to them. It's easy enough to make a flavor with tiny bits or soggy bits, so I am definitely pleased with the crunch level here. The low fat chocolate base isn't bad, but there is a hint of chewiness. Nothing awful, but the texture is a smidge off, but when can only complain with half the fat. Chocolate flavor is decent, and the whole thing comes together pretty well. My biggest thought while eating this was actually "hmmm, I wonder if this would make an awesome milkshake?" I hope to answer that question with a second scoop soon. On Second Scoop: I can admit that this flavor isn't doing a whole lot for me. It's not bad, it's just not super exciting. It's just one of those so-so/decent flavors, but I will admit that I was starting to have some fun as a I discovered several layers of cookie crunch close to each other in the center of the container. Hey, you take what excitement you can get and run with it! On Third Scoop: Oh man, the third time was a charm on this flavor! I just dug into these huge chunks of crunchy cookie swirl layer and it was heavenly. It was like a thin layer of chocolate ice cream between two thinly sliced brownies (or like a regular Oreo cookie but with ice cream instead of cream). Oh man I wish every bite was like those several I just had. I know they can't be, but man, simply fantastic. Mmmmm, even leaves you with an awesome aftertaste. All I can say is that I can't believe it took you 3 scoops before you got it right. I don't even let my family try this flavor for fear that they will consume my 2 backup cartons that I hide in the basement freezer. I've been eating this flavor almost exclusively for a year and never grow tired of it. do you find that your typical experience is like my third scoop? or is it more of once you've had that third scoop, you are hooked? I am addicted! It is my favorite ice cream in the stores. My only complaint is it is sometimes difficult to find.